What is Concentrating Solar Energy? Concentrating solar technologies typically use lenses or mirrors to concentrate sunlight to create significantly more heat and/or radiation that can be used in variety of applications. Concentrating Photovoltaic Technology differs considerably from traditional “non-concentrating” technologies such as those found in photovoltaic panels. Those panels utilize only the direct amount (one (1) sun) of energy at a given location. Jetstream’s proprietary parabolic solar collector makes it is possible to focus the sunlight to intensities of 800 to 1200 times those of normal sunlight. A concentrating photovoltaic system uses a dense array of high-efficiency solar cells. These solar cells are typically more expensive than conventional cells used for flat-plate photovoltaic systems. However, the concentration decreases the required cell area while also increasing the cell efficiency. Scalable to a range of sizes. Jetstream’s CPV systems are highly cost effective systems combining a reasonably simple, reliable, low maintenance solar collector with extremely efficient dense array modules. With rapid manufacturing and implementation, and even portability, the company is able to generate electricity or in the case of NewGen™, sell alternative energy generation equipment at prices that are highly competitive. With a few alterations to the basic solar thermal platform, and the addition of advanced optics and specialized proprietary modules, Jetstream is able to harness energy from the sun in ways that allow its equipment to desalinate and treat water and create hydrogen. Through the use of the optics and adjustable focal points, the systems use varying temperatures to activate the varying technologies. Many critical industrial processes are costly primarily because of the energy and environmental costs that are imbedded in those processes. Jetstream has the ability to replace much of that cost with clean “free” solar energy. ﻿Power Tower utilizes a large number of heliostats (flat mirrors) that are computer controlled to focus on a centralized receiver at the top of a high tower. High operating temperatures heat transfer fluids, which creates steam when contacting water and runs a central steam generator. While effective, these systems are very expensive and complex. Additionally, some of them require prodigious amounts of water due to the use of steam powered electric generators. This is obviously a serious problem in water-deprived areas, (such as those that offer the greatest amount of sunlight). 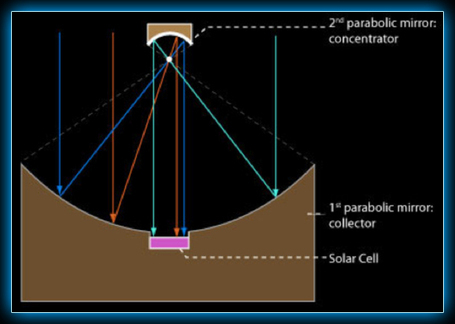 Linear Concentrators, often called Trough Solar, are parabolically shaped troughs that focus the sun on a tube typically filled with a synthetic oil. The concentration factor is limited to approximately 30 to 40. Other Concentrating Solar Technologies have been developed (and are developing), however, they have not been commercially viable.